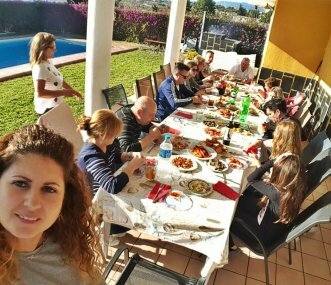 Get together with a group of friends or extended family to rent a large holiday apartment in Madrid, or hire a Spanish villa in Castilla La Mancha. Rent a Spanish villa in Alicante, a large apartment in Benidorm, or a holiday villa in Valencia to enjoy the Mediterranean beaches of the Costa Blanca, which stretches from the town of Denia in the north to Torrevieja in the south. You can explore big resorts such as Benidorm or enjoy smaller beaches such as El Saler and Gandia; see mountain scenery around Monte Pedreguer; or visit the city of Valencia itself, which is famous for its mix of historic and modern architecture, and the colourful Fallas fiesta. In Central Spain you can enjoy the capital, Madrid, which is home to world-class museums and art galleries, historic architecture and many green, open spaces such as the famous Parque del Retiro. Or you can explore the surrounding plateau of Castilla La Mancha, with its sunflower fields, windmills and olive groves. Large villa for groups of 22-24 people and with everything you need. Swimming pool, games room, karaoke lounge and giant screen with cinema. Between sea, mountains, near Alicante on the Costa Blanca. Great villa for holiday rental, groups, singles farewells, reunions, barbecues, large families, friends and various groups are welcome. Maximum 30 people, always with exclusive use to one group. Superb holiday complex, overlooking town, mountain, and sea. Ideal for groups, families, friends, schools, corporate. Set in the hills above the town, with lovely views down to the Mediterranean Sea. Camp el Planet is ideal for families, friends and groups that want to combine activities and exercise with sun, sea and mountains in beautiful and idyllic surroundings.